(Minghui.org) Three international investigators released an in-depth update on the killing of prisoners of conscience for their organs in China at the National Press Club in Washington, D.C. on June 22, 2016. Their extensive research, based on media reports, medical journals, hospital websites, and web archives, concludes that the number of transplants performed in China–and the number of victims–are much higher than previously estimated. David Kilgour, former Canadian Secretary of State for Asia-Pacific, and human rights lawyer David Matas, published Bloody Harvest: Organ Harvesting of Falun Gong Practitioners in China in 2009 to shine a light on the harvesting of organs from living Falun Gong practitioners in China, millions of whom have been detained or imprisoned for their belief. Ethan Gutmann, an award-winning China analyst and investigative journalist, published The Slaughter: Mass Killings, Organ Harvesting, and China’s Secret Solution to Its Dissident Problem in 2014, after conducting an independent investigation. David Kilgour, former Canadian Secretary of State for Asia-Pacific, led a press conference on the release of their new report at the National Press Club on June 22. Human Rights Lawyer David Matas, published Bloody Harvest: Organ Harvesting of Falun Gong Practitioners in China in 2009, together with Kilgour. This report’s release and press conference came several days after the U.S. House of Representatives unanimously passed H.Res. 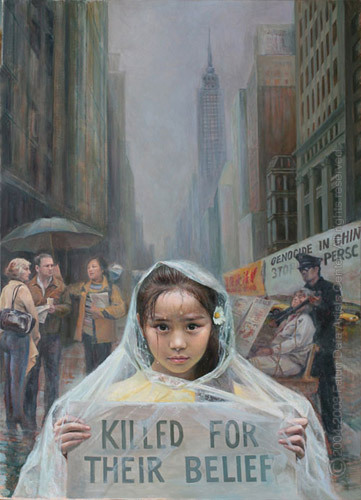 343 on June 13, condemning the systematic, state-sanctioned organ harvesting from non-consenting prisoners of conscience in China, including from large numbers of Falun Gong practitioners and members of other religious and ethnic minority groups. This new 680-page report (available for download at www.endorganpillaging.org) provides a comprehensive update to the investigation work by the three authors over the past decade. With more than 2,300 references, it includes a large volume of information collected from media reports, promotional materials in China, medical journals, and hospital websites. Because many Chinese transplant-related websites were deleted or modified after forced organ harvesting came to light in 2006, the report also delved into information found in website archives. In addition, the investigators examined the number of transplants, hospital bed capacity, medical staff training, and government policies and funding. In most countries, patients have to wait years for a kidney or liver transplant. In China, however, many matching organs were located within weeks–or even days, including thousands of emergency liver transplants for patients requiring a new organ within 72 hours. Some hospitals even offered guarantees of finding a living or kidney donor within two weeks. From promotional materials or websites of Chinese hospitals, it was claimed that donors are readily available for patients who need organs. In case of rejection, some hospitals were able to source multiple organs for one patient. Moreover, hospitals listed their fees for organ transplants online. Some have built amenities to attract attract foreign patients (transplant tourists), a number of whom were charged hundreds of thousands or even millions of USD for an organ transplant. Waiting times were generally short, many on the order of weeks. Ethan Gutmann, an award-winning China analyst and investigative journalist, presented updates for forced organ harvesting in China. Another phenomenon the investigators found was the huge number of organ transplants performed in China. According to hospital websites, doctors’ experiences, or media reports, some medical teams performed organ transplants one after another, with hardly any breaks. Some transplant centers’ bed utilization regularly exceeded 100%. As new buildings are constructed, facilities expanded, and beds added, organ transplant chief Huang Jiefu announced his plan in 2015 to issue transplant licenses to more hospitals, from 169 to 300. Because of Chinese traditions requiring that bodies be preserved whole after death and the lack of an effective donation system, voluntary organ donation is very rare in China. However, the large number of organs located within such short timeframes raise questions regarding their sources. The sources claimed by Chinese officials–executed prisoners (before 2015) and voluntary donations–account for only a small fraction of the number of transplants performed. After forced organ harvesting first attracted international attention in 2006, Chinese institutions rushed to modify or delete online data related to organ transplantation. Although China’s official number of transplants is around 10,000 a year, this number could easily be surpassed by just a few hospitals. In 2007, more than 1,000 hospitals applied for organ transplant permits from the Ministry of Health in 2007, indicating that they at least met the minimum transplant bed counts required. Based on minimum capacity requirements stipulated by the Ministry, the 146 hospitals permitted to conduct kidney and liver transplants could have conducted at least one million transplant surgeries since 2000. In reality, all of these institutions are operating well above the minimum capacity. In addition, many institutions without permits from the Ministry are also conducting organ transplants at scale. After news media exposed forced organ harvesting in China in 2006, evidence has shown that this practice has continued, although it became more secretive. Because of “problems with the organ sources,” as stated by a well-known transplant doctor, the number of transplants are often under-reported and poorly documented, making a determination of accurate numbers very difficult. The report also covered the involvement of military, Communist Party, and government organizations in carrying out organ harvesting from prisoners of conscience, including the disappearances and forced medical tests of Falun Gong practitioners in state custody. From sources of patients to hospitals’ credentials, capacity, personnel qualifications, and funding, the report collects detailed information in conjunction with whistleblower testimonies from witnesses to establish a network of systematic supply chains of organ harvesting, a profit-driven and state-sanctioned crime. The tragedy does not end with organ harvesting and organ transplants. When many plastinated body exhibitions toured around the world, the sources of the bodies—most of them from China—was a mystery. Increasing evidence has linked them to detained Falun Gong practitioners, and many of them are discussed in the report. The report states, “Starting in July, authorities launched a nationwide crackdown on the legal community, detaining more than 300 lawyers and law associates on charges ranging from ‘picking quarrels and provoking trouble’ to ‘inciting subversion of state power.’ Many of them were held for months under ‘residential surveillance at an undisclosed location,’ without access to attorneys or to their family members, in violation of criminal procedure laws.” These “disappeared lawyers” included Wang Yu, Li Heping, Xie Yanyi, Zhang Kai, and others. Wang and Li are still in custody. (Minghui.org) After reading recent reports on the Chinese Minghui website, there seems indication that many Chinese legal professionals are changing their stance on Falun Gong and are no longer strictly following the Chinese Communist Party’s (CCP) policy on persecuting Falun Gong practitioners. Several recent instances are listed below. Falun Gong practitioners Zhou Xiangyang and Li Shanshan from Tianjin were tried and sentenced by the Dongli District People’s Court. Their lawyers and families filed a lawsuit against the judge for violating legal procedures during the trial. The court then decided to hold a new trial. Such an occurrence usually wouldn’t have happened in the past. According to analysts, there could be two reasons for the new trial. First, the judge is afraid of being held accountable for his violation of legal procedure. Second, those who participated in the first trial are trying to show that they are following the rule of law, making the case that they should not be held accountable for prior legal violations when the persecution of Falun Gong ends and perpetrators are brought to justice. Falun Gong practitioners Gao Jianping, Wei Ningju and Wu Jinlan were arrested by officers from the Litong District Domestic Security Division in Wuzhong City, Ningxia Autonomous Region, on November 10, 2015, because they filed a lawsuit against Jiang Zemin, the former head of the CCP who launched the brutal persecution. The case was sent to the Procuratorate, but was twice returned to the Domestic Security Division. Falun Gong practitioner Mr. Zhang Jinsheng’s case underwent a second hearing at the Gucheng County Court of Hengshui, Hebei Province. The charge was the usual boilerplate “using a cult for sabotaging implementation of law.” The defense lawyer refuted the charges and pointed out that Mr. Zhang had been tortured by the police. Mr. Zhang’s lawyer argued that the content on the CD proved that Mr. Zhang was not guilty of any criminal activity, and only showed Falun Gong practitioners’ compassion for the Chinese people. Falun Gong practitioner Ms. Cai Suping’s case was heard for the third time at the Industrial Park Court of Suzhou, Jiangsu Province, on March 25. Ms. Cai’s lawyer argued that she was innocent. The judge finally read a verdict, announcing an 8-month prison term, and then notified Ms. Cai’s husband that he could take her home on April 7. A practitioner was recently released after the local court refused to try her for exposing the persecution of Falun Gong. Ms. Li Meiling, a Falun Gong practitioner from Houma City, Shanxi Province, was arrested on September 25, 2015, while distributing information about the persecution. The local Procuratorate issued a formal arrest warrant on October 30 and forwarded her case to the local court. The court, however, declined to prosecute Ms. Li. The local judicial bureau also showed no interest in getting involved. The police had no choice but to issue Ms. Li a retroactive six-month detention, and released her on March 25, 2016. During the morning rush on a bridge in a major port city in southern China recently, a large commemorative stone inscription at the head of the bridge split cleanly down the middle, half of it falling onto the road. But it wasn’t just any stone. The white granite slab bore the calligraphy and signature of former Chinese Communist Party leader Jiang Zemin, and was erected in a 2008 ceremony to open the 2.95 billion yuan (about $450 million) bridge, which connects the district of Jimei and the island of Xiamen in Fujian Province. “Jimei Bridge,” it said, followed by Jiang’s name on the bottom right. According to several reports in mainland Chinese news outlets, cleanup workers say that the stone slab, which was nearly twice as high as a person, snapped at between 3 to 4 a.m. in the morning of Feb. 29. No one was injured, but the one half had crushed a metal railing and blocked half a lane. One cleanup worker told Southeast Express Daily, the newspaper of the Fujian provincial government, that the granite stone inscription could already possess defects, and probably split on its own accord after extended exposure to the elements. But the stone had split on a clear, calm morning—the Xiamen meteorological station said wind speeds only reached a maximum of 1.9 m/s or 0.85 mph on Feb. 29—causing Chinese netizens to speculate on just what caused it. It’s too ‘natural’ … This is very unusual. A video of the moment the stone split was also put online and carried in several news broadcasts. It’s unclear who recorded the video, which appears to be a cellphone video of security camera footage. The matter of inscriptions on stones by top Party officials is a highly political question in communist China. State companies often welcome the visit of a top leader, who may be so generous as to bequeath a piece of his calligraphy, or an inscription (called “tici” in Chinese) which is then chiseled into a granite or a metal plaque. Jiang Zemin was particularly well known for leaving his inscriptions around China, as demonstrated in this case. The longevity of these monuments, therefore, is also a political question. Epoch Times has published numerous editorials arguing that the struggle between Jiang Zemin—for decades the godfather of the Communist Party—and Xi Jinping, who assumed power in late 2012, has been driving nearly all major events in China for the last four years. Since coming to power in 2012, Party leader Xi Jinping has sought to root out Jiang’s political network through a sweeping anti-corruption campaign. In recent months, Xi has ordered a major military reform and conducted a very public tour of the Party’s press agencies, moves that political analyst say are efforts by Xi to consolidate his power. Although Jiang Zemin had relinquished his position as Party leader in 2002, he continued to hold considerable sway over Party affairs and the running of the country for more than a decade, not unlike his predecessors Deng Xiaoping and Chairman Mao Zedong. The potent symbolism of calligraphy inscriptions was revealed most recently last August, when a stone stele bearing Jiang’s inscription, displayed prominently on the front lawn of the Central Party School in Beijing, was suddenly dug up by tractors and removed. The Party School is the regime’s main center for ideological indoctrination and professional training of its cadre corps. Observers of Chinese politics saw it as a clear indication of Xi’s intent to further marginalize Jiang, a process that may ultimately result in the elder’s arrest. (Minghui.org) This report is the first in a series of many to present statistical summaries of data compiled from Minghui’s vast storehouse of firsthand accounts about the persecution of Falun Gong in China. The report addresses court cases brought against Falun Gong practitioners that were reported on the Minghui website from January through June, 2015. We would be pleased to hear your feedback! Those who practice Falun Gong in China are persecuted because they refuse to give up their beliefs and because they dare to speak out publicly against the oppression they face. Governments, NGOs and concerned citizens the world over have condemned the persecution, but it has continued for over sixteen years nevertheless. From January through June 2015, Minghui published reports of 393 Falun Gong practitioners “tried” in Chinese courts. The vast majority of the court appearances were show trials with trumped up charges and guilty verdicts a foregone conclusion. Of the 393, 110 Falun Gong practitioners were reportedly tortured in custody. At least 206 had their homes ransacked by police or Party officials. At least 98 endured forced labor. Of the 393, the length of sentence was reported for 383 cases. Sentences ranged from 4 months to 9 years in length, with an average of 4.0 years. Most were sentenced to prison. Gender was reported in 94% of cases, with women far outnumbering men (72% to 28%). The age was reported in 193 of the cases (roughly half), and ranged from 30 to 84, with an average age of 56. China’s communist regime maintains a strict Internet blockade that aggressively filters out information about Falun Gong. Thus the true scope of the persecution is likely much greater than that evidenced by reports on Minghui. NEW YORK—A new report details how, for the last ten years, Chinese officials have supported a multi-million dollar human trafficking operation that involves murdering Chinese citizens and plastinising their cadavers, a procedure that replaces body fluids with polymers for tissue preservation. Evidence further suggests that the vast majority of victims are Falun Gong practitioners. The report (view online) comes in the wake of mounting evidence and growing attention to organ transplant abuses by Chinese military hospitals where, again, victims are mostly Falun Gong practitioners. The World Organization to Investigate the Persecution of Falun Gong, WOIPFG, published the report on November 24. It states that China has become the largest exporter of human specimens, which, when fully preserved through plastination might sell for $800,000 USD. Evidence suggests that public security provides the vast majority of cadavers. The source of cadavers is not executed criminals, however, but prisoners of conscience from labor camps and brain washing centers, the report maintains. The report corroborates phone recordings with government officials, publications by medical universities, advertisements by Chinese plastination companies and the expansion of labor camps to accommodate detained Falun Gong practitioners. Several pieces of evidence specifically implicate former Communist Party chief, Bo Xilai, and his wife, Gu Kailai. Bo controlled numerous labor camps that are in close proximity to the largest plastination factories in China. To view a previous press release on organ transplant abuse, see here. For a Falun Dafa Information Center Fact Sheet on organ harvesting, including the connection to Bo Xilai and other officials, see here.